RoseMary Vande Hei, age 88, passed away March 25, 2019 at Rennes Health & Rehab Center in De Pere, WI, surrounded by family. She was born May 10, 1930 in the town of Hobart. She was the daughter of August and Minnie Ver Cauteren. RoseMary married Alvin Vande Hei on June 25, 1949. They enjoyed 61 years of marriage. Alvin and RoseMary farmed in the town of Hobart. She was a cook for many years before retiring in Lakewood in the home they built with their children, friends and family. After retiring, both Alvin and RoseMary worked at Camp Nan-A-Bo-Sho (YMCA camp) on Waubee Lake. RoseMary is survived by her children: David (Connie) Vande Hei, Janet (Brian) Hart, Jeff (Connie) Vande Hei and Julie (Larry) Hamilton; 14 grandchildren: Robert Vande Hei, Cherie (Jon) Cadieux, Heather Vande Hei, Charlie Vande Hei, Joseph (Christina) Vande Hei, Angela (Larry) Vieaux, Robert Van Hulst , Ashley (Mike) Rummel, Christopher (Larissa) Vande Hei, Weston Winkers, Leah (Deven) Walrack, Megan Vande Hei, Anna Vande Hei, and Katelyn Vande Hei; and several great-grandchildren. She is further survived by one sister, Carol Van Den Elzen; two sisters-in-law: Grace Vande Hei and Dell Ver Cauteren; and many nieces, nephews, other relatives and friends. RoseMary is preceded in death by her parents; her husband, Alvin; two sons: Vernon (Butch) and Alois (Snuffy) Vande Hei; siblings: Lucelle (Emmett) Mullen, Eleanore (Alvin) Goffard, Marcella (Jim) Vande Hei, Ray (Doris) Ver Cauteren, Donald Van Den Elzen; all of the Vande Hei brothers/wives; and Alvin’s parents. 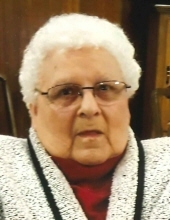 There will be a visitation held for RoseMary on Saturday, March 30, 2019 from 10:00 a.m. until the time of service at noon at RYAN FUNERAL HOME, 305 N. 10th St. De Pere. Burial will take place in Mount Calvary Cemetery. Online condolences may be expressed at www.ryanfh.com. In lieu of flowers, a memorial fund in RoseMary’s name will be established to go to the YMCA camp. The family would like to give a special thank you to the staff at Rennes for their care and compassion for RoseMary. To send flowers or a remembrance gift to the family of RoseMary Vande Hei, please visit our Tribute Store. "Email Address" would like to share the life celebration of RoseMary Vande Hei. Click on the "link" to go to share a favorite memory or leave a condolence message for the family.